The anthropology major holds various highlights, special features and opportunities for Augustana students. As part of its 2014 service project, Augustana's Anthropology Club created an archeology dig for Girl Scouts Dakota Horizons' 3rd annual BIG Event at the Sioux Falls Convention Center on Saturday, May 3, 2014. The annual event provides hands-on learning opportunities to engage girls in Science, Technology, Engineering and Math (STEM) activities. Dr. Hannus led a team of archaeologists on the new PBS series, Time Team America. The concept of Time Team America is modeled after the long running, extremely popular British Time Team production. Five, one-hour shows (in which Dr. Hannus participated) were filmed across the United States during the 2008 summer season and premiered the following summer. Three historic localities were visited: Fort Raleigh (The Lost Colony), New Philadelphia and Fort James in South Dakota. Filming was also conducted at two prehistoric sites: Range Creek and the Topper site. The series producers use public entertainment as a format to promote the rich educational value of archaeology. The mammoth sculpture at the Archeology Laboratory (above image) is a full-sized replica of a mammoth excavated from a deposit that dates back more than 11,000 years ago. Every Christmas, it is decorated with nearly 10,000 lights. Researchers at the Archeology Laboratory have conducted work on historic and prehistoric sites as recent as 50 years old and as old as more than 11,000 years—the time encompassing the entire human occupation of the Northern Plains. 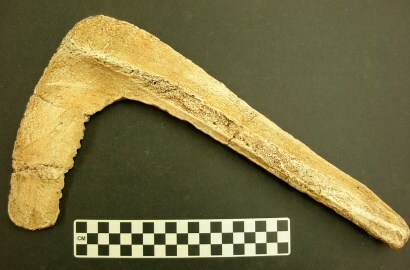 The recent discovery of a bison scapula sickle (at right) from the Mitchell Prehistoric Indian Village is one of only several such specimens ever discovered.